Slide the green button left and right to compare the two views. 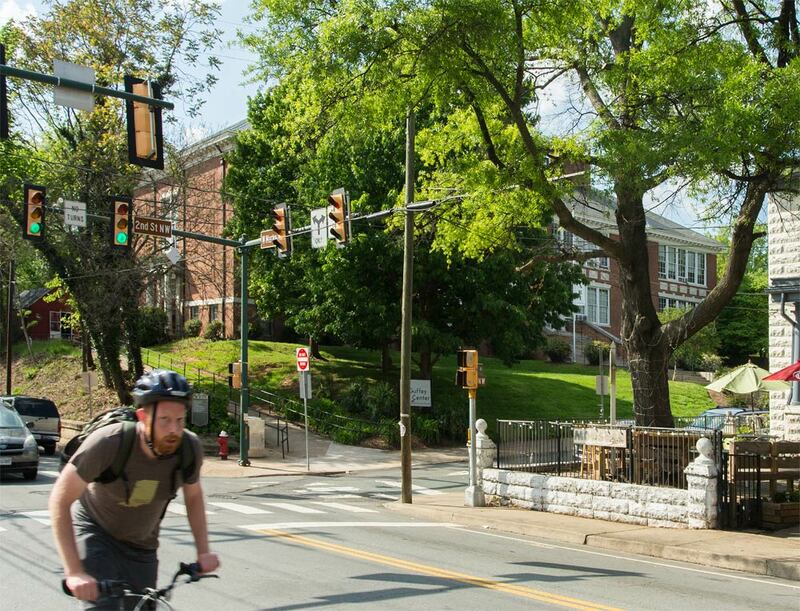 In the first years of the 20th century, University Avenue was dug out and a trestle was built over the road. 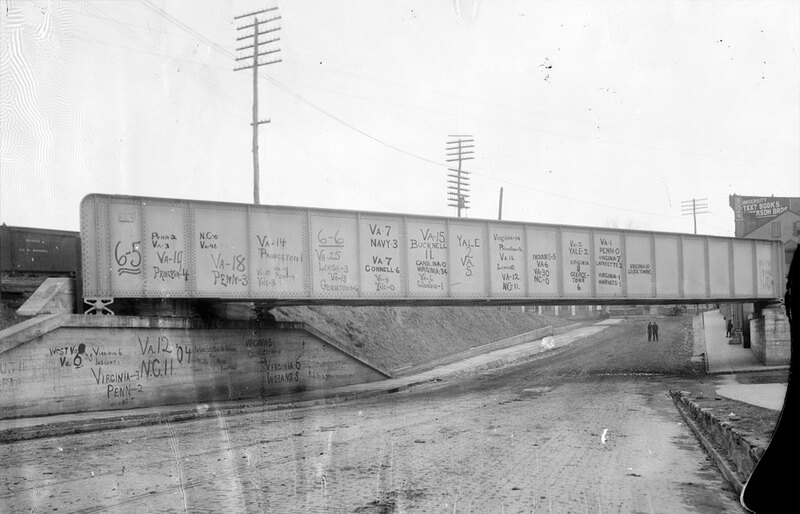 Soon after, students began advertising the University’s football and baseball achievements on the bridge. The 1906 Holsinger photograph shows that the University’s athletic teams were very successful against Ivy League Teams. 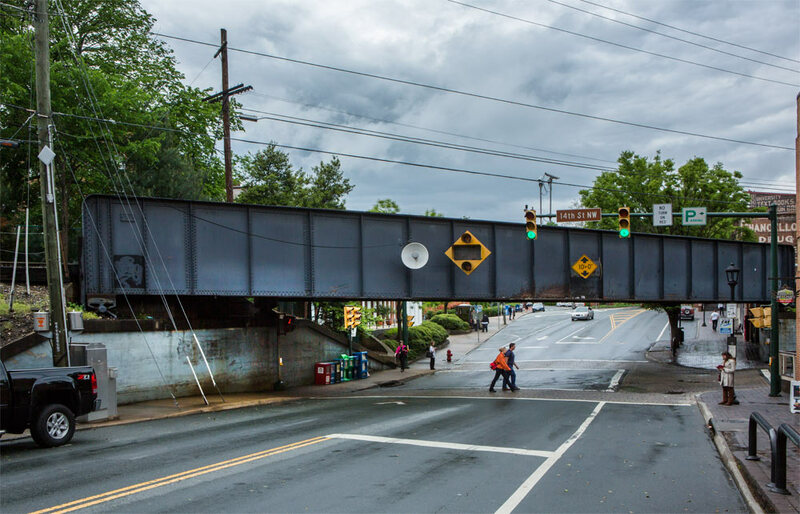 Today the Corner’s trestle is perhaps best known for the numerous trucks that get stuck beneath it. 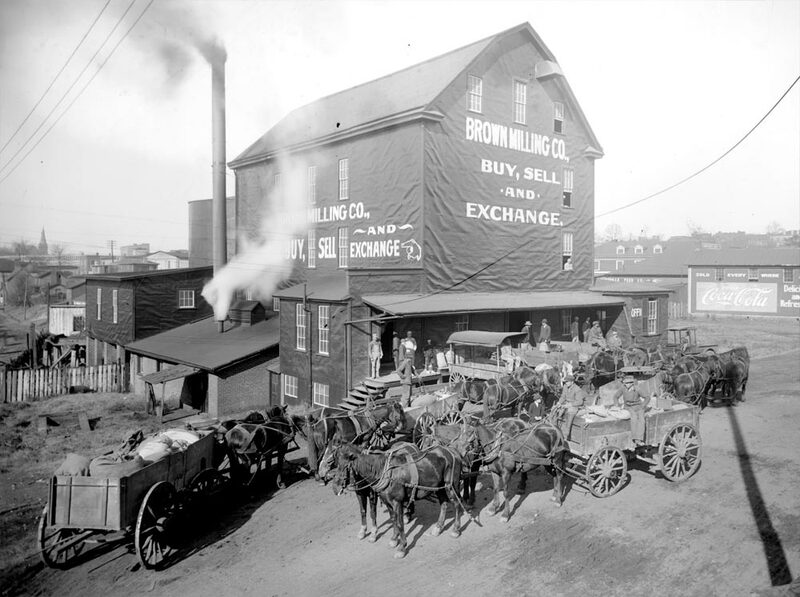 In the days of this 1917 Holsinger photograph, Brown Milling Company, like many other mills, not only processed grains, but did a lively business of exchange as well. Farmers drove large horse-drawn wagons loaded with wheat, corn, oats and rye, to the mill for a morning of selling and trading. Today, the building is home to HVAC contractor Beck-Cohen. 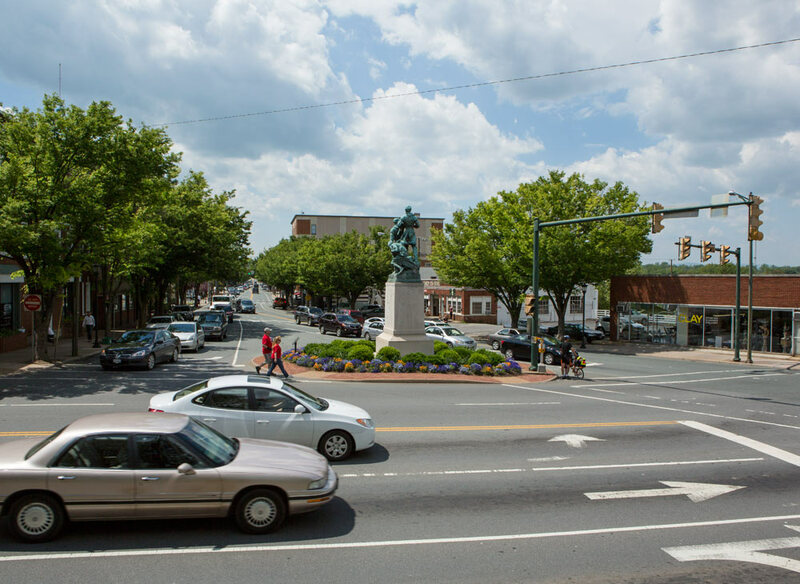 In 1761, the seat of Albemarle County was moved to Charlottesville from Scottsville. 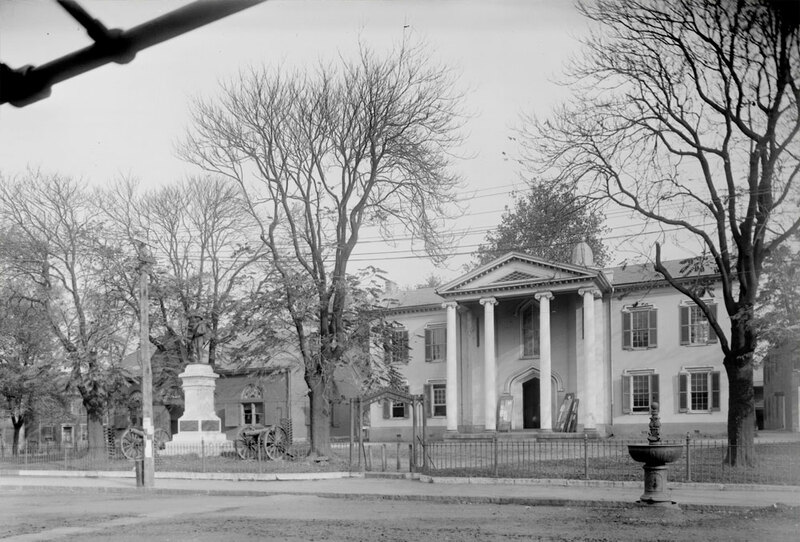 A courthouse was erected near the site of the left wing of the present structure. The Holsinger photograph was taken in 1910. In 1938 the court house was completely restored. The Monument to the Confederate Soldier with cannons on either side of it, unveiled in 1909, still stands in front of the court house today. 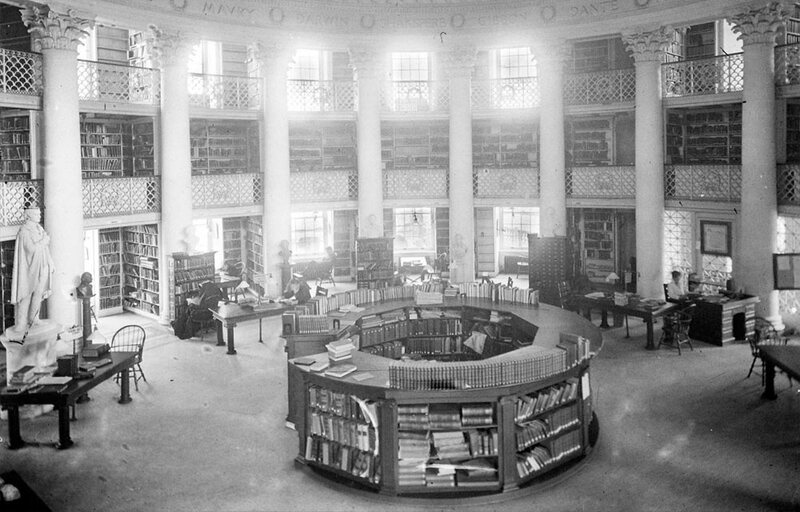 Holsinger’s photograph shows the renovated Rotunda Dome Room, then used as the University’s library, designed by McKim, Mead & White after the fire of 1895. The firm redesigned the Rotunda in the Beaux Arts style, characterized by heavy use of classical detail and ornamentation, and increased the height of the Dome Room by removing a floor. 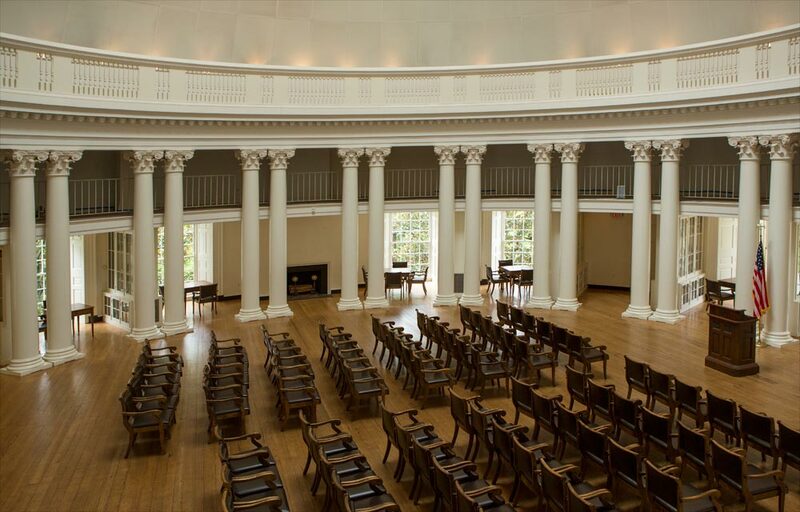 In 1976, architecture professor Frederick Nichols led a massive renovation that completely gutted the interior to restore the Rotunda to Jefferson’s original plan. That interior remains today. The Monticello Guard was formed in 1857 and was descended from other military units that had served Charlottesville from as early as 1758. 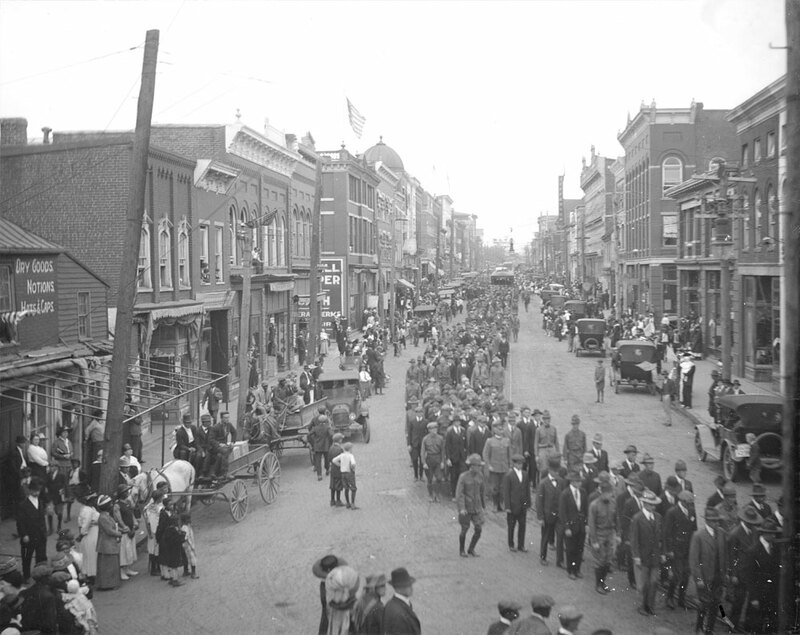 Holsinger’s 1917 photo shows the Guard parading down East Main Street on their way to Camp McClellan, Alabama for training in trench warfare. The company served in the Meuse-Argonne and Chateau-Thierry sectors of France for most of World War I. It suffered heavy casualties in both dead and wounded. 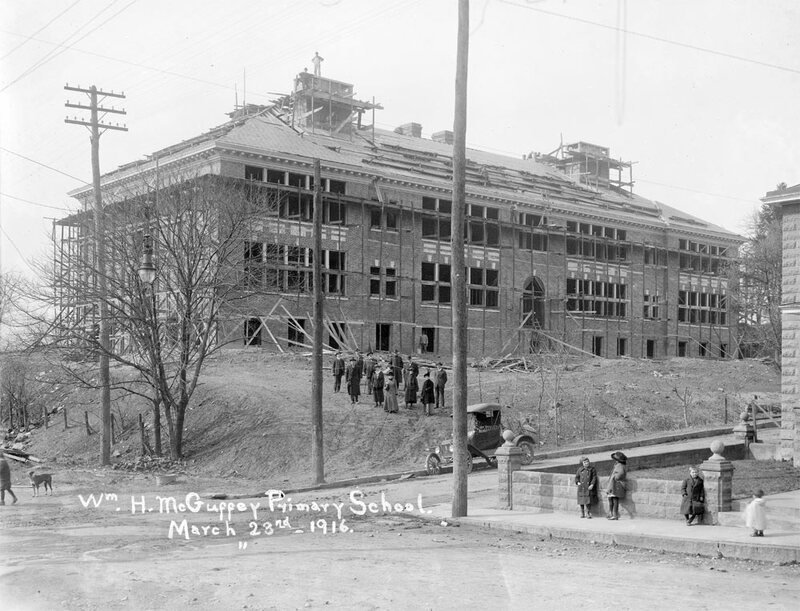 Built in 1916, McGuffey School served the city’s grammar school children for more than 50 years. 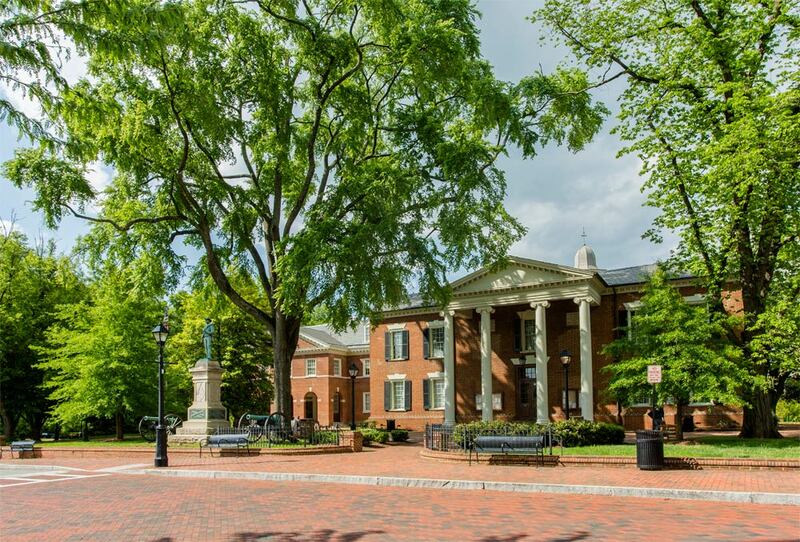 It was named after the educator, William Holmes McGuffey, who came to Charlottesville in 1845 as professor of moral philosophy at UVA. Today it is the city-owned McGuffey Art Center. 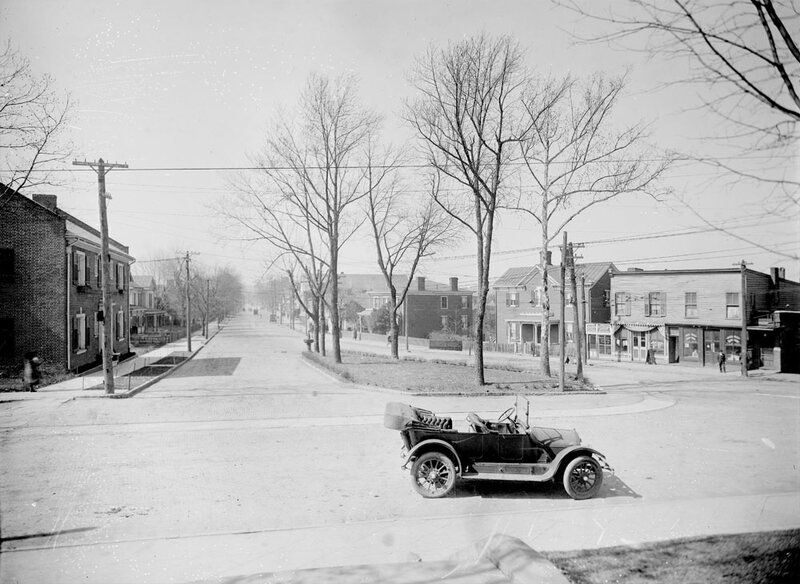 The 1917 Holsinger photo was taken at the top of Vinegar Hill, looking west. The Lewis and Clark statue was not yet erected. Vinegar Hill itself (once called Random Row) was filled with shops and homes, all long gone. 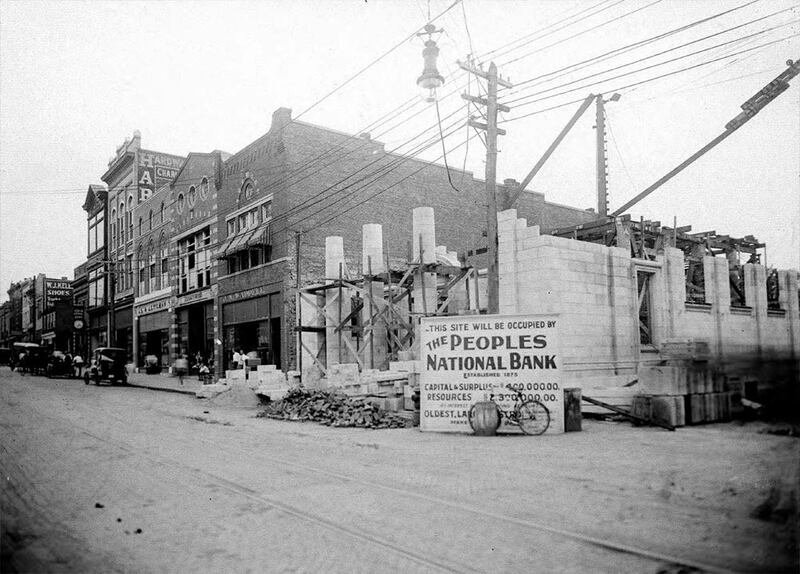 In 1916 construction of the People’s National Bank building was underway on East Main Street. 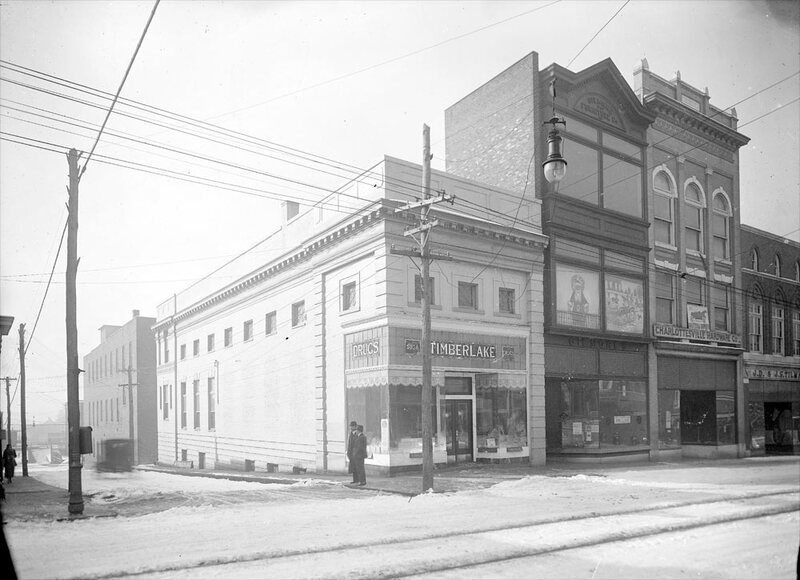 Pictured are some of the leading businesses at that time: Waddell’s shoe store, Wood’s clothing store, Tilman’s department store and the Charlottesville Hardware Store. Today the building is a Bank of America. 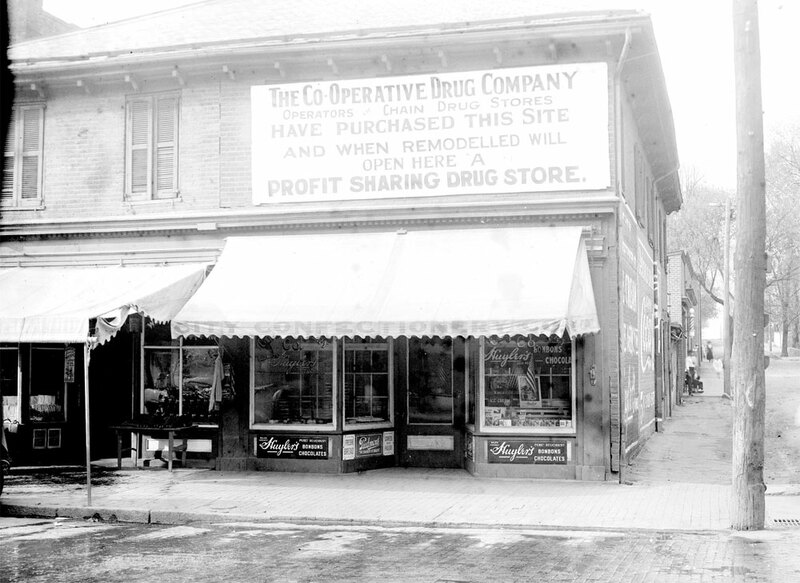 The Co-Operative Drug Company in Holsinger’s photo was one of the early “chain” stores in the years before World War I. The profit sharing in the sign was in the form of a rebate given to customers who spent over a certain amount of money in a year. 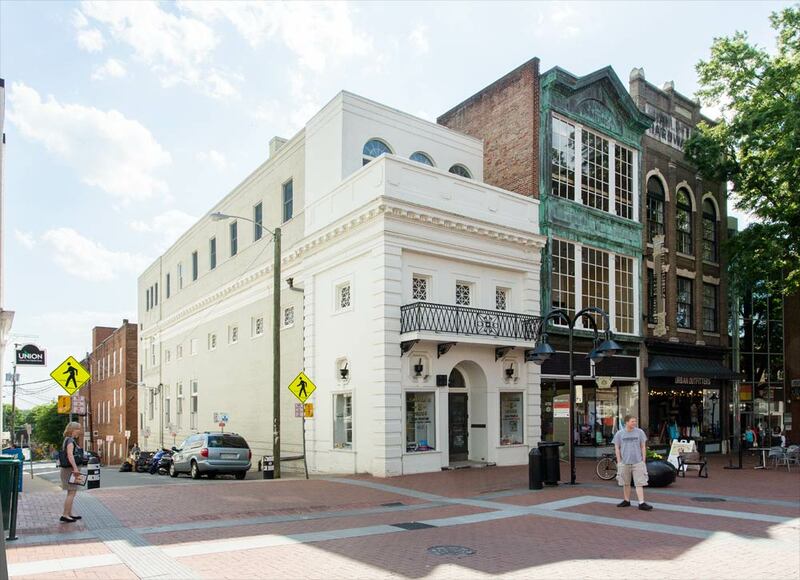 The building, on the corner of 3rd and Main streets, was previously owned by the City Confectionary Company. Rock Paper Scissors, a paper store, is on the site today. 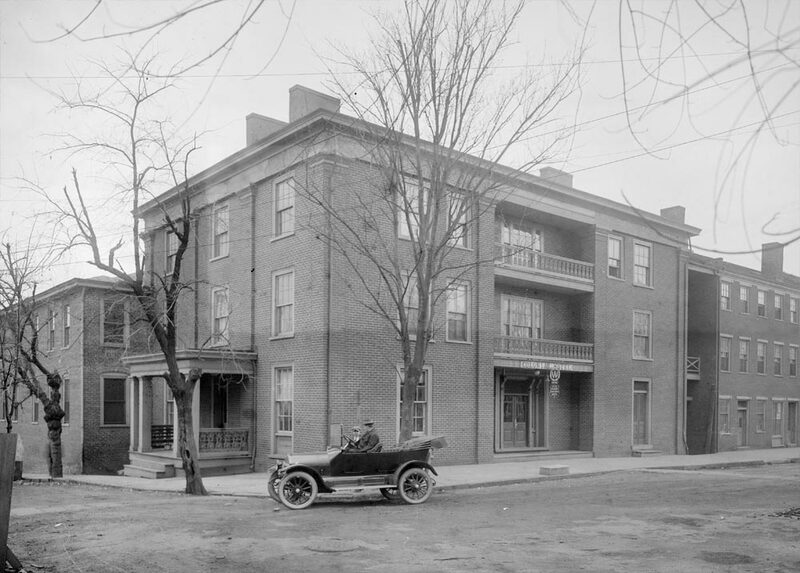 Holsinger’s 1915 photograph shows the Colonial Hotel, formerly an Annex of the Monticello Hotel on Court Square. 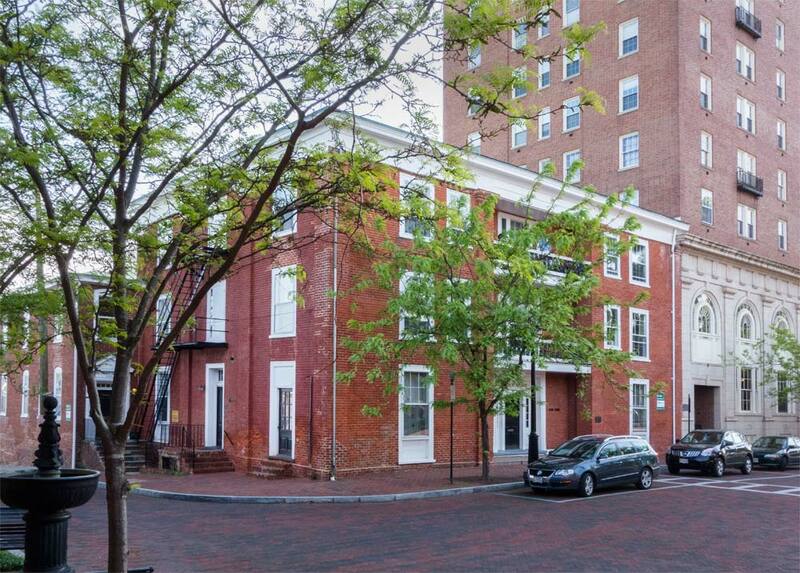 The building date of the original tavern on this site is uncertain, but it was sometime before 1791. From that time on, it was the site of public entertainment. The tavern became the Colonial Hotel before World War I. The Colonial Hotel stayed in operation until the mid 1920s. 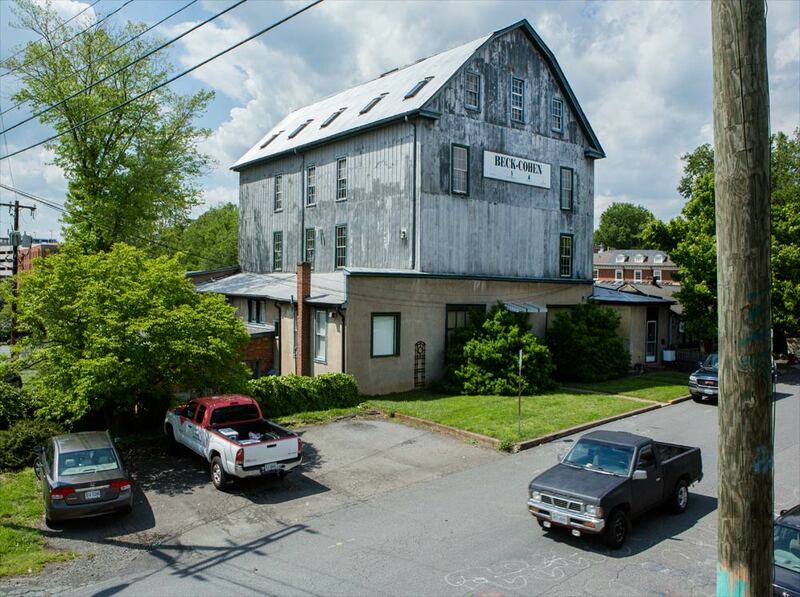 Today it is an office building, currently for sale for $2.6 million. Photo captions come partially from the book, Holsinger’s Charlottesville: A Collection of Photographs by Rufus W. Holsinger, by Cecile Wendover Clover and F.T. Heblich, Jr.
Holsinger photos courtesy of the University of Virginia Library. View the collection. 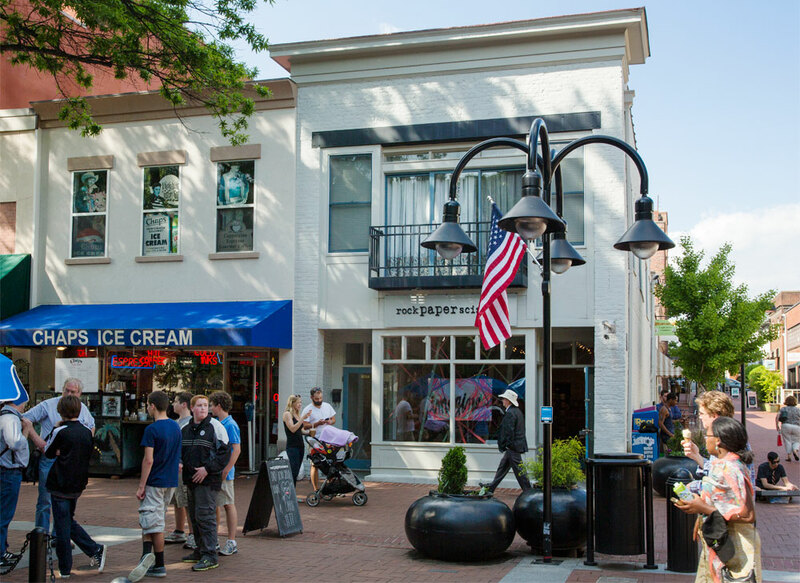 Born and raised in Charlottesville. Great piece of history. Clark school.Lane High. Hogwalla.big hill.and rives street playing sandlot football. Andy Lawson mayor of Hogwalla. So many great memories. Thank you so much. Ever since I picked up a copy of the book “Holsinger’s Charlottesville,” I’ve been trying to do this very thing in my imagination. You’ve obviously taken great pains to find those viewpoints and focal lengths, and the result is breathtaking to view! Stacey, you succeed in evoking confluence of time and place. It’s as if you’ve raise the blinds and 100 years have passed. Wonderfully skilled work represented here. The ability of Stacey to put herself in just the right location and use her camera to capture the perfectly aligned shot is amazing. What a wonderful comparison! 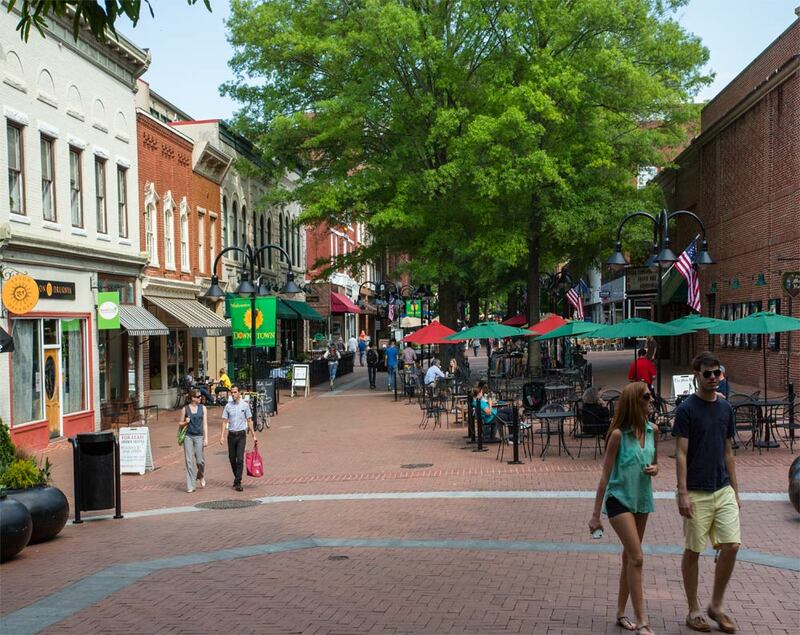 I have been in charlottesville all of my 47 years and I can’t believe the transformation of this city! This made me proud to be a part of this fine city or town! Thank you so much! Wonderful job. Very thoughtful work which gives a real sense of how the city changed, especially since the early 1960’s. Thanks for the thorough research. Great to see. Before my time, but I was born in 1949 so I do remember things looking much like this. Thank you. Love it. 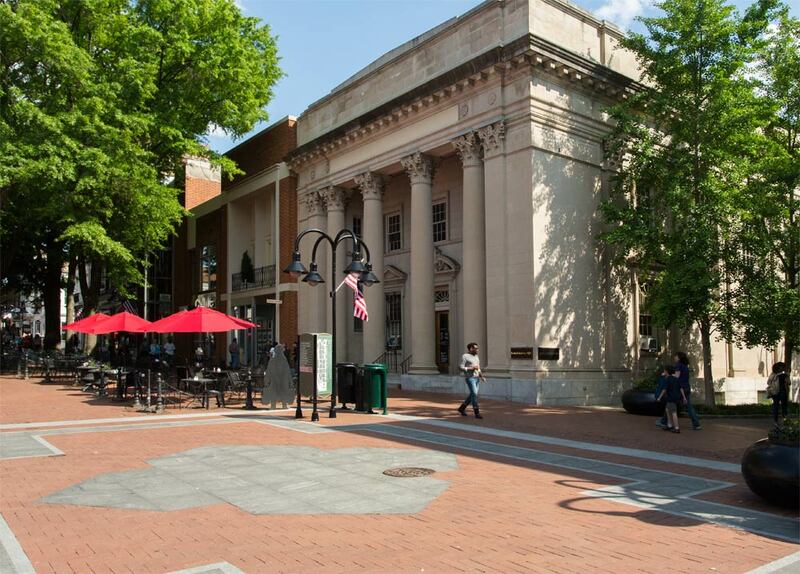 Lived in Charlottesville ‘49 - ‘55, 3rd - 8th grades. Came back for Belmont Boys Reunion in Spring ‘15. Judy Lynch gave me a tour of the town So impressed then and now by these pictures of the great preservation culture. I live 27 miles north of Houston (where they seem to replace everything every 25-50 years!) in The Woodlands Texas. Plan to be back with the Belmont Boys in ‘17! 1923, and built our home, a flint rock English style house on Woodrow St.
walking up down and up Vinegar Hill on my way to the Jefferson Movie Theater. more. Many, many thanks and kudos. Beautiful ‘show’ of a wonderful place! I really enjoyed this, Thanks Stacey! Just wanted to add my name to the long list to say thank you for such a thoughtful, painstaking, and professionally rendered project. - top notch! Lived in Charlottesville most of my life, left Virginia in 2015 to live in California. I hope it stays true to itself, its a wonderful place to have grown up. Thanks for this, what a blast!